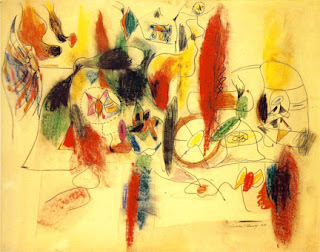 bilingual blog bilingue de la curiosité: Arshile Gorky and fauvism, cubism, surrealism, expressionism, etc. 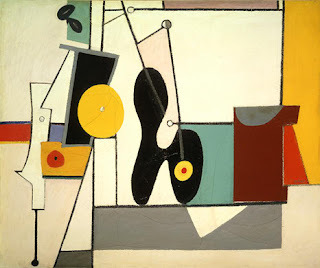 Arshile Gorky and fauvism, cubism, surrealism, expressionism, etc. Gorky is such a talented painter. His composition are stunning. His palette in mind blowing. And he never quite grew up to be his own painter. 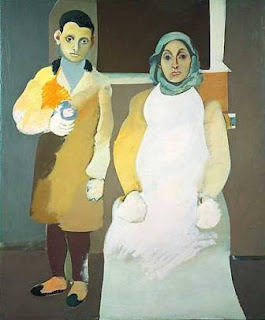 Going through the exhibition, you get the Cézanne period, the Fauvist period, the Picasso monumental mythological women period, then the Picasso cubist period - my favorite, while the painting of himself and his mother is incredibly powerful (The artist and his mother, below). Then you get the feeling he saw a Kandinsky while in his surrealist period, and then you wonder how much he was influenced by De Kooning, how much they built up their expressionist style together. Maybe that's the most personal of his style, but it didn't impress me most, the compositions didn't seem as assured as during his previous periods. It still gives the impression he never came to his own, as if he couldn't own painting. I felt like saying, go for it, Gorky, you can do it. The last years of his life were marked by personal tragedy, as they say, which is unlikely to have helped him reach maturity. But altogether, through all the different periods, the work is really beautiful, with plenty of drama in them..